In our daily life, we deal with various data such as names, addresses, money, date, stock quotes, statistics and more. If you are in business or working as a professional, you have to handle even more data. For example, a doctor needs to keep track of patients’ personal and medical information such as names, addresses, phone numbers as well as blood pressure readings, blood sugar readings, surgical history, medicines prescribed in the past and more. On the other hand, businesses usually have to manage a large amount of data pertaining to products and customers. All these data need to be organized into a database for the ease of data management. In the past , people usually deal with data manually like using cards and folders. However, in present Information age, it is no longer feasible to manage data manually. Most data are now managed using computer-based database management systems. Computer-based Database management systems can handle data much faster and more efficient than human beings do. With the advent of the network and the Internet technologies, data can now be managed locally and remotely. Database management systems are usually used in running payroll system, inventory system, accounting system, payment system, order handling system, customer relationship management system(CRM) and more. Some of the commercial database management system(DBMS) are Oracle, Microsoft SQL server and Microsoft Access. A database management system typically deals with storing, modifying, and extracting information from a database. It can also add, edit and delete records from the database. However, a DBMS can be very difficult to handle by ordinary people or businessmen who have no technological backgrounds. Fortunately, we can create user-friendly database applications to handle the aforementioned jobs with the DBMS running in the background. One of the best programs that can create such database application is none other than Visual Basic 2015. Visual Basic 2015 uses ADO.NET to handle databases. ADO.NET is Microsoft’s latest database technology which can work with many other advanced database management systems such as Microsoft SQL server. In this Lesson, we will develop codes that make use of Microsoft SQL Server 2015, therefore you need to have Microsoft SQL Server 2012 installed in your PC, you can download Microsoft SQL Server 2012 Express for free from https://www.microsoft.com/en-us/download/details.aspx?id=29062. 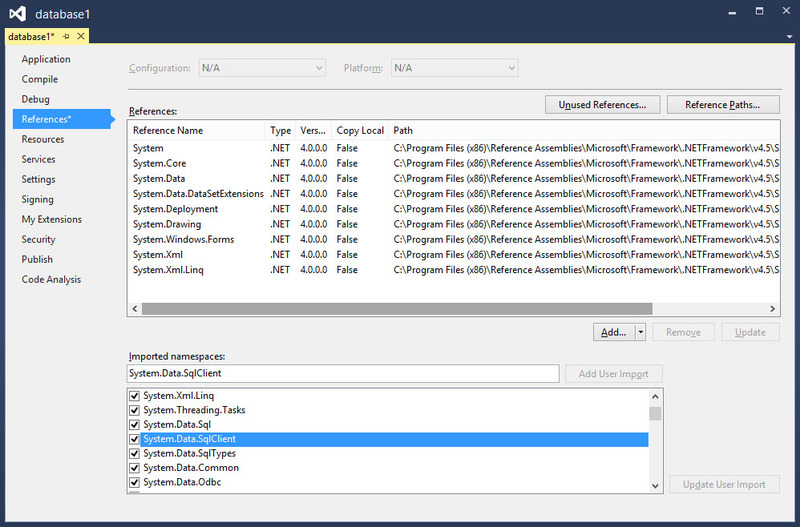 Under imported namespaces, make sure system.data, System.Data.Sqlclient is selected, otherwise, check them. Having done that you need to click the Save All button on the toolbar and then return to the Visual Basic 2015 IDE. We shall proceed to create a connection to the database source file in the next Lesson.